In just a few short weeks we will be traveling to our second Photo Plus Expo in New York City (October 26-28). 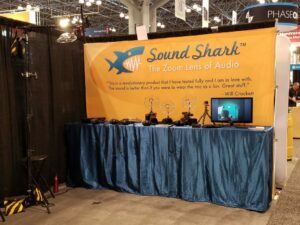 This year Sound Shark will be booth #1249. So stop by and say hello. Again this year, we will be conducting a side by side comparison of the Sound Shark with various shotgun microphones. We will also be bringing along our new black version we’ve built in response to customer requests. So stop by booth 1249 to see, and hear, for yourself! If you haven’t registered yet, you can use our link to get a free pass. Register here. Here is our booth at Photo Plus Expo 2016.